The calendar administrator can get an overview of active notifications in the calendar Settings, including change Notifications delivered by email, Daily Agenda delivered by email, and change notifications posted to Slack channels. This allows the administrator to set up notifications even when the notification function is disabled for non-administrator users, and remove notifications when an employee leaves the organization. Please note a user account is required to set up Event Reminders which alert users of upcoming events. Click on the blue menu button and select Settings. You will be directed by default to General Settings page. Where it says Notifications, you will tick the ENABLE USER SIGNUP box. Here you can also add notification subscriptions for your users, but be sure to select the correct link that has the appropriate permission for that user because the notification email going to that email address will contain the link you choose here. Never choose an administrator link as mentioned below when setting up notifications for non-administrator users. Learn more about security here. Please note that notifications are sent for future events only for free calendars and those on the Plus plan. Your calendars needs to be on Premium Plan to send notifications for past events that are modified. Please make sure to choose the appropriate link when you add new notifications – the notification email contains the link from which the notification is setup. Do not use the administrator link for notifications to be sent to non-administrator users. 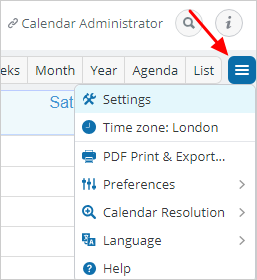 Non-calendar Administrators: If you are looking for information on how notifications work or how to enable / disable notifications for yourself, please see our articles on How To Use Email Notifications, How To Use Daily Agenda. Teamup Calendar Administrator: if you are looking to use Reminders, please check our Event Reminders article. Slack Administrators: If you are a Slack administrator and would like to send notifications to your Slack channel when changes occur on your Teamup Calendar, please see How to Set Up a Teamup Slack Integration (for group and private channels).